I have been RVing full time for over 2 years, now and this book has been on my wish list for longer than that! I finally read How to Travel Full-Time, recently, and I could not put it down. Written by a full time traveler, Colin Wright tells how he came to the decision to travel full time, how he started out and how he does it now. He addresses relationships, medical care and earning an income. He emphasizes the need to understand that other countries have different cultures and ways of living. The impact of tourism and the ethics of impacting other cultures by the footprint we leave behind. This is like a handbook for full-time travel, and it’s staying on my shelf (actually, in my kindle) until I’m ready to move on to world travel. Wright shares dozens of tips for downsizing, minimizing and packing light. He details his personal packing list – one carry on bag. He also gives advice for getting from one place to another and finding housing. Also discussed are the importance of planning ahead, getting the appropriate vaccinations, options for getting your mail, and paying taxes. Personal anecdotes demonstrate the ups and downs of travel and the value of resourcefulness. They also make the book an easy read. Above all, the author emphasizes exploring and enjoying your new home, making friends and documenting your journey – both as a souvenir, and for future enjoyment. If you dream of traveling full-time “someday”, I definitely recommend this book. You may decide that “someday” needs to come sooner than you think! 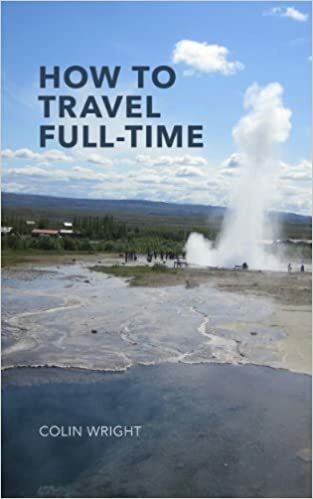 How to Travel Full-Time, by Colin Wright $.99 as of today. Disclaimer: I purchased this book on Amazon several months ago. No compensation is being received for this review.